The Slowly Boiled Frog: So what did it cost NOM to allegedly unseat a Missouri legislator and did they? National Organization for Marriage is taking a victory lap this morning because Missouri Republican state senator Anne Zerr was defeated in her primary yesterday. As previously reported NOM does not like Zerr because she voted against SJR 39 which would have put a license-to-discriminate on the ballot in November. 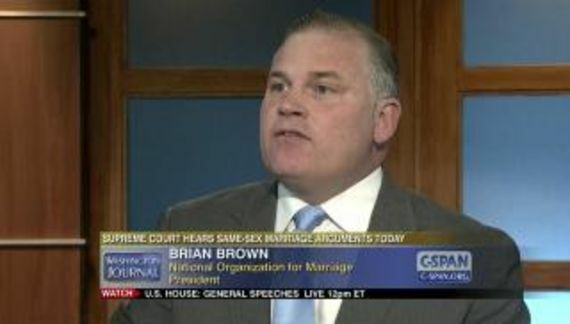 Brian Brown clearly does not appreciate the difference between causation and correlation. According to campaign finance reports, NOM spent $6,838. The largest expenditure was $4,867 for a mailer. They spent $400 on robo-calls, $825 on legal fees and the rest on sundry expenses. National Organization for Marriage (NOM) vowed to end her political career. NOM delivered last night when Zerr was defeated in the GOP primary for state Senate. NOM mounted an independent expenditure campaign funding mailers and phone calls to oppose Zerr and endorse her opponent, Rep. Bill Eigel. With all precincts reporting, Eigel has defeated Zerr by 385 votes.